The percentages you get for regions in your ethnicity estimate are the most likely results we get after comparing your DNA to our reference panel. But they are not the only results. There are other possibilities that are nearly as likely. This is why we present your results as a range of possible percentages. This is true of any company’s ethnicity estimate on the market right now. Here at AncestryDNA we are transparent about what our results mean and continue to build upon our previous work to offer ever-more-accurate results to our customers. 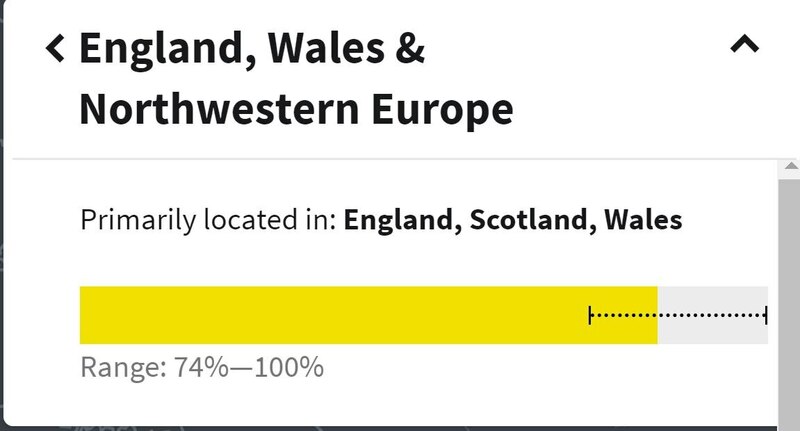 Imagine that your results say that you are 84% England, Wales & Northwestern Europe. That 84% is the most likely number within a range of percentages that are also likely. Less likely, but not necessarily by much. We show the data as a rectangle and fill in the amount we report back as most likely with a color. Here, 84% of the rectangle has been shaded in yellow to represent your most likely percentage for this ethnicity. The dotted line represents the range. The range is written out below the rectangle. Here it is 74-100%. These ranges are important to look at, especially for results with lower percentages. In these cases, the range can sometimes include zero. This means that for these results, it is possible that your ancestors didn’t live in that region or you didn’t inherit any DNA from ancestors who did. The person in the example we showed earlier has a lot of England, Wales & Northwestern Europe in their DNA results. Most likely 84%, but the range indicates that anywhere from 74% to 100% is also possible. How do we determine that range? In addition to the most likely estimate, our algorithm also generates 1,000 likely estimates using the probabilities learned from comparing your genetic data to our reference panel. We use these 1,000 likely estimates, which may be different from your most likely estimate, to figure out the range. The way we calculate the range will depend on the region and the value of your most likely estimate. If you want to know more about how we calculate these ranges, please see our white paper.